Grand-Uncle - Jiri Holik - Shared the gold medal at the 1972 World’s with his brother, Jaroslav. Mother - Andrea Holikova - Was an international tennis sensation winning the women’s singles title at Wimbleton in 1985 plus helping Czechoslovakia win the Federation Cup the same year. 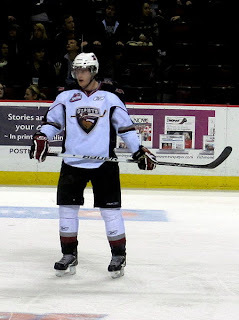 David has the prototypical size to go along with the bloodlines that scouts are looking for so it should come as no surprise that David was so highly sought-after that the WHL had to hold a special lottery just for his rights. Then at sixteen he had an excellent first season in the DUB leading up to his draft year. How did David ‘s draft year shape up? First the good news, NHL Central Scouting's B.J. MacDonald told NHL.com in February "He anchors their defense. When he was out with an injury, they really, really missed him back there. ... His overall game is very solid. A lot of scouts are worried about his skating. He is not the smoothest skater, but he gets the job done. He rarely gets beat, and his 1-on-1's are solid. He always makes that first good outlet pass and on the tape. He has a short stride for a big guy but should improve”. So David Musil is definitely a guy I would want on my team - the bloodlines, the size, the reach, the positioning, the shot-blocking, the minute eating, the first pass are just too much to pass up. However, David’s game has not progressed at the same rate as some of his peers. So that is the reason David has fallen on the ISS rankings from a top five at the beginning of the year to late first round at the end of the year (or second round where I and some others have him). His offensive game in particular never really appeared and it doesn’t look like it will in the future. His negatives are more in the way of non-superlatives, just average skating, inconsistency in his intensity, not always as physical as you would like and sometimes makes questionable decisions with the puck. He also finished the season with a rather unexceptional playoff and a so-so U18. In summary, none of the negatives are show stoppers and can be worked on while the positives are high-end enough that you would be happy to have this “Czech Master” on your team. Late first is still a possibility for this big guy who probably will be a solid third or fourth defenseman in the NHL but he may fall to early second.